I started making shirts a while ago being fairly succesful with it so far, thanks mostly to the David Page Coffin Book on the topic. One of my biggest problems has been, that I wasn't able to produce any decent looking buttonholes on my old Bernina sewing machine, so I started looking into doing it by hand. I think I read most of the postings on the topic so far, but I'm still struggling with the result. Altough I know that it is mostly a matter of practice, I just wanted to make sure that what I practice is the right thing. I am currently using the DMC Floche, based on a recommondation on this forum (previously I used the gütermann mara 30) and the simpler buttonhole stitch, as opposed to the tailored buttonhole stitch (to creat little pearls, rather than the little knots). One of my issues is that the little pearls on the inside of each side overlap in a rather unflattering fashion. 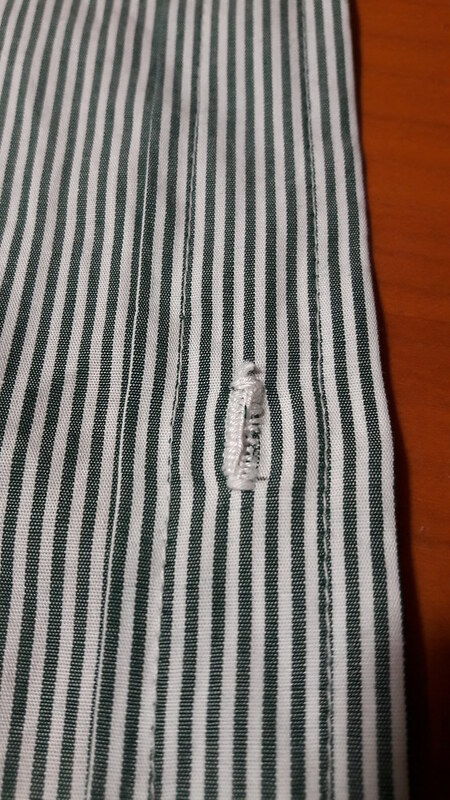 I attach some pictures of my own efforts and some of the more prominent italian shirtmakers. There buttonholes seems to not overlap at all, i.e. are looking much cleaner. I wonder if my technique is wrong or it is just a matter of practice. and, as it shlould be. There always seems to be a small gap between the edges of the buttonhole which I don't know how to achieve. I doesn't look like mere stretching of the finished buttonhole, does it? There are also some great pictures on the Facebook site of Mary Frittolini. 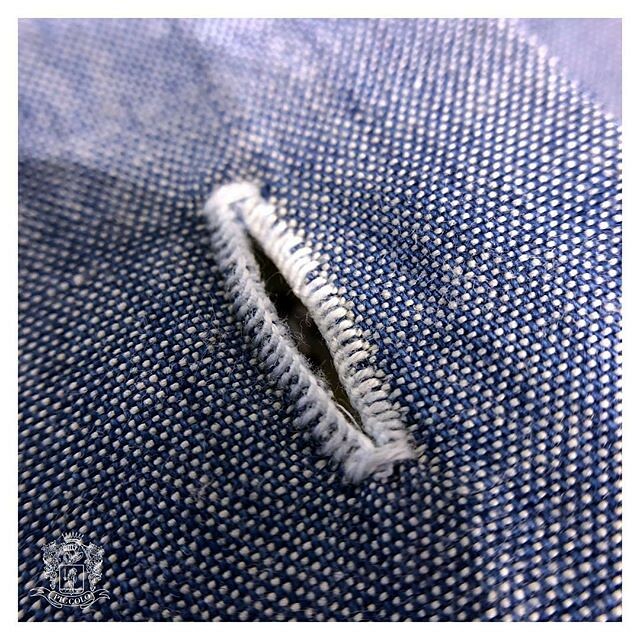 Try to work the buttonhole in the other direction (instead of upwards work it downwards). They stitches will appear different because of the yarn twist. It also makes a difference in wich direction you pull the little knots close. I prefer to pull them close perpendicular to the fabric, so the knots lie on the surface of the fabric. I also have a tip for nice machine buttonholes: make the stitches only 1,5mm wide instead of the usual 2mm and use a buttonhole foot. This foot has two small grooves wich keep the two collums parallel but apart. I never use the half automatic of my machine. She seems to use a diffrent stitch then I did. The outcome - copying her work - does already look more similar to the pictures above than my earlier efforts. I try to post some pictures of it tommorow. So I tried the technique shown in the video above a few times and I think it works realy well. For some reason the knots seem to align much less prominent altough I pulled them rather horizontal, as done in the video. So here is an effort I did on a failed shirt attempt of mine and of course it's as far from perfect as it gets, but I think that it is the right technique after all. Seems like the thread is thicker than it ought to be. Thinner thread would take more knots, so, more time, but look better and I believe, more functional. 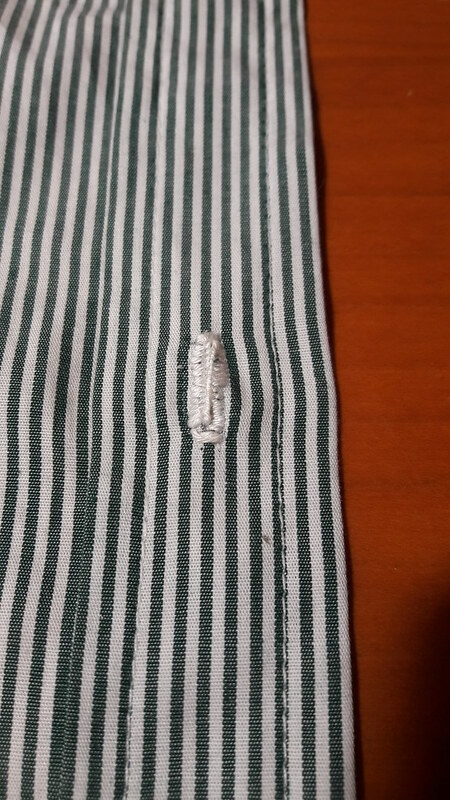 If the button is pulling from the end, instead of side, I would make a keyhole buttonhole (collar stand). 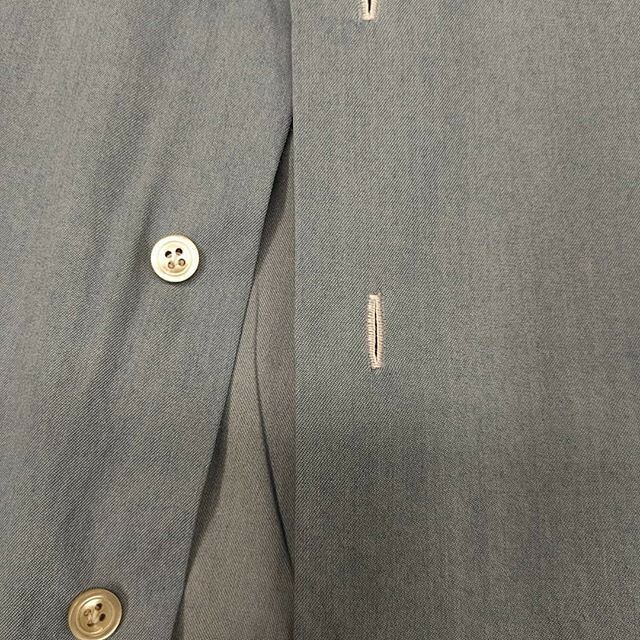 The regular buttonholes on a shirt run parallel to sides of the shirt, except the ones of the collar stand. Thanks greger. I will try some diffrent thread. I already tried the Gütermann Mara 30 which is poly thread, but it doesn't look right. I think it lacks the elasticity of cotton. If you have any recommondation I would be rather grateful. Concerning the keyhole shape: should I cut a small hole on one side, or just work around one end? Try Coton a broder 25, DMC is Ok.
Was that 16 thread you were using? Edited by Schneiderfrei, 25 March 2019 - 11:50 PM. You can try to get coton a broder. The white one usually comes in different thicknesses, because it is also used for whitework. Also mouline is a good choice. It is usually a 6 strand stitching yarn, wich is divisible. You can take a single strand for buttonholes. Edited by peterle, 25 March 2019 - 11:59 PM. It was the DMC coton a broder. It was the thinnest one available at the local store, I think it was 25. 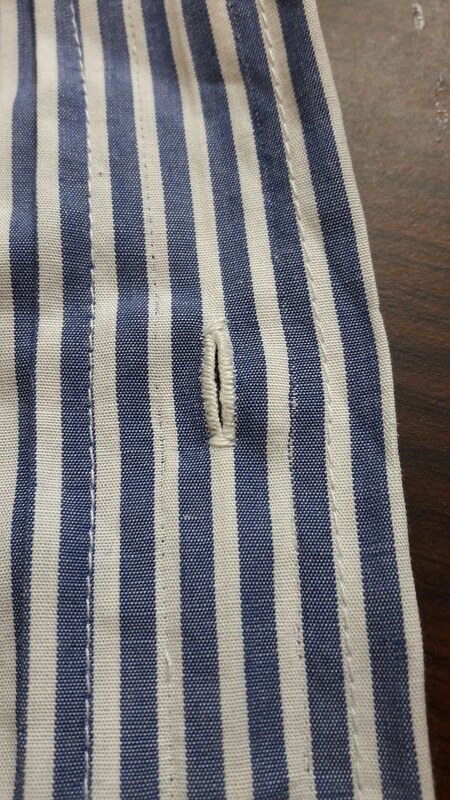 However the whole buttonhole was rather short, maybe therefore the thread looks thicker. I got myself some DMC mouline and will try to work some BH with it. One single thread however looks rather thin, but I will try to get some pictures. I have found that the single strand mouline may not last as long. Yes Newbie, I thought it was a matter of scale, unless it had been 16. I started off using thin gutermann, as you might with a sewing machine. It was not at all satisfying. It's a lot better. Just a bit wonky with the angles. Looks nice. Not perfect, but I think you'll get better easily. I use the edge of my thumbnail as a guide for for where the point of the needle comes up. Or, a hair back. I would put the knots high enough that the button rest on it, and not the shifting, when buttoned. Now you want a good presentation of a good looking buttonholes on the front of the shirt. Later, start working on the back side of the buttonholes to look as good as the front. For keyhole make two very small snips at one end. And work around that. The hole size, just larger than the button threads that are going through it. The other part is for the button. Thanks greger for the advice. I will definitly try to move the knots a littler higher. Despite the aesthetics, is there another reason that the button should rest on the knots? Is it more durable? 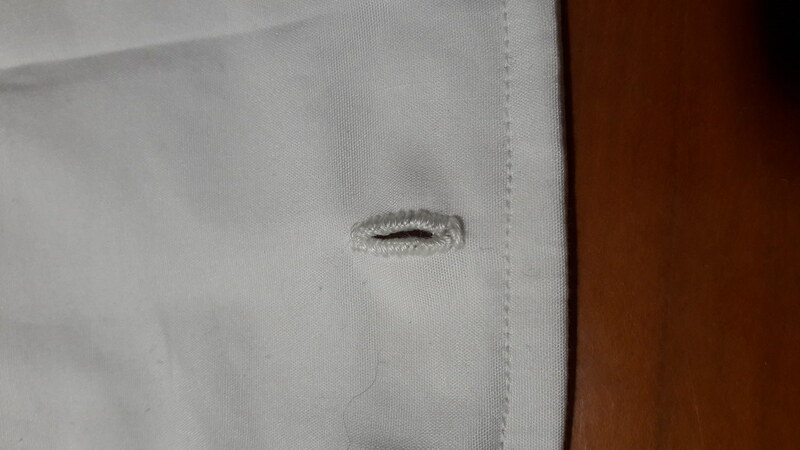 Concerning the back side, I was wondering if anybody is working the buttonhole on the collar stand from bothsides, since it is highly visible when worn without a tie or should you just try to work as clean as possible on the backside as well? Anyway, again, thank you all for your help so far. You can work the stand buttonhole like whitework: Trace a runningstitch line around the buttonhole with a fine thread before you cut it, and then work each stich in two steps: first dive the needle through the buttonhole, then grab the needle underneath and stitch it back to the surface strictly vertically on the edge of the runnigstitch line. The running stitch will be covered by the buttonholestitches. This makes the backside tidy but is much more work.